A HUMAN PERSPECTIVE On September 28, 2000, riots broke out in the city of Jerusalem. The cause was a visit by an Israeli political leader to a Jewish holy place at a location on the Temple Mount. Muslims also have a holy place on the Temple Mount. They viewed the visit by the Israeli leader as disrespectful to Muslims. Hundreds of people died in the civil unrest that followed. To understand why a simple visit to a holy place would cause such problems, it is necessary to understand the deep-seated hostility Arabs and Jews feel for each other. They have an enormous disagreement over the control of the city of Jerusalem and of the land called the Occupied Territories. In fact, the relations between Arabs and Jews affect the entire region of the Eastern Mediterranean. Three major monotheistic religions—Judaism, Christianity, and Islam—were founded in Southwest Asia. All three claim Jerusalem as a holy city. The City of Jerusalem, which covers 42 square miles, has Jewish, Christian, Armenian Christian, and Muslim sections. Followers of all three religions come to the Old City to visit locations with strong spiritual meaning. For Jews, Jerusalem, the capital of Israel, is the center of their modern and ancient homeland. Located in the old part of the city, the Temple Mount once housed the religion’s earliest temples. There, King Solomon built the First Temple. The Second Temple was constructed after the Jews returned to their homeland in 538 B.C. Modern Jews come to pray at the holiest site in Jerusalem, a portion of the Second Temple known as the Western Wall—also called the Wailing Wall. It is the only remaining piece of the Second Temple, which was destroyed in A.D. 70 by the Romans. For Christians, Jerusalem is the sacred location of the final suffering and crucifixion of Jesus. Towns and villages important in the life of Jesus are found near Jerusalem. Every year, Christians visit places like the Mount of Olives and the Church of the Holy Sepulchre by the thousands. When Jerusalem was under Muslim control, Christians launched the Crusades to regain the lands and place them under the control of Christians. Eventually, the lands returned to the control of Muslims and remained that way until the nation of Israel was established in May of 1948. After Mecca and Medina, Jerusalem is considered the third most holy city to Muslims. A shrine there, called Dome of the Rock, houses the spot where Muslims believe the Prophet Muhammad rose into heaven. Jews believe it is the site where Abraham, a Jewish forefather, prepared to sacrifice his son Isaac to God. The Dome of the Rock and a nearby mosque, Al-Aqsa, are located on the Temple Mount next to the Western Wall. Because these most holy sites are so close together, they have been the site of clashes between Jews and Muslims. The nations of the Eastern Mediterranean have been plagued with a history of political tension and unrest. The Ottoman Empire, a Muslim government based in Turkey, ruled the Eastern Mediterranean lands from 1520 to 1922. But the Ottoman Empire grew weaker and less able to solve problems with groups seeking independence. By the beginning of the 20th century, its collapse was not far away. The Ottoman Empire sided with Germany during World War I. At the end of the war, the Ottoman Empire fell apart. Britain and France received the lands in the Eastern Mediterranean as part of the war settlement. After World War I, Britain and France divided the Ottoman lands in the Eastern Mediterranean region. France took the northern portion, including the present-day countries of Lebanon and Syria. Britain controlled the southern section, which included the present-day nations of Jordan and Israel. Britain and France were supposed to rule these lands until they were ready for independence. During the time of their control, the French frequently played different religious groups against each other. Those tensions remain in the region today. The Syrians hated the French and in the 1920s and 1930s rebelled against them. Lebanon became independent in 1943, and Syria gained independence in 1946. The land controlled by Britain was known as Palestine. In the 19th century, a movement called Zionism began. Its goal was to create and support a Jewish homeland in Palestine. Jewish settlers started buying land and settling there. By 1914, just before World War I, about 12 percent of the population in Palestine was Jewish. After the war, the British took command of the region and continued to allow Jewish immigration to Palestine. Early on, Arabs and Jews in the region cooperated. But as more and more Jews poured into Palestine to escape persecution in Germany, the Arabs resisted the establishment of a Jewish state. In 1939, to reduce tensions the British halted Jewish immigration to Palestine. As you study the map on this page, you will see that the area controlled by the British was divided into two sections—Transjordan and Palestine. The land was divided to relieve tensions between Arabs and Jews. An Arab government jointly ruled Transjordan with the British. Britain controlled Palestine, along with local governments that included both Jews and Arabs. At the end of World War II, thousands of Jewish survivors of the Holocaust wanted to settle in Palestine. Palestine was considered the Jewish homeland. World opinion supported the establishment of a Jewish nation-state. Britain eventually referred the question of a Jewish homeland to the United Nations. In 1947, the United Nations developed a plan to divide Palestine into two states—one for Arabs and one for Jews. Arabs in the region did not agree with the division. However, the nation of Israel was established on May 14, 1948. 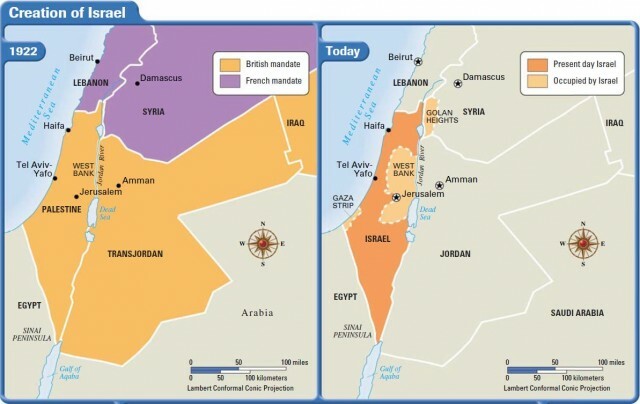 Immediately, the surrounding Arab nations of Egypt, Syria, Lebanon, Jordan, Iraq, Saudi Arabia, and Yemen invaded Israel to prevent the establishment of the state. Jewish troops fought back. By the 1950s, Israel was a firmly established nation. The 1948 war was the beginning of hostilities that continue to this day. Caught in the middle of this turmoil were Palestinian Arabs and Christians. Many of these people had roots in Palestine that went back for centuries. They either fled their homes or were forced into UN-sponsored refugee camps just outside Israel’s borders. The land designated for the Palestinians on the West Bank and Gaza Strip is under Israeli control. In the 1960s, the Palestine Liberation Organization (PLO) was formed to regain the land for Palestinian Arabs. Over the years, the PLO has pursued political and military means to take possession of Arab land in Israel and allow refugees to return to their homes. The nations in the Eastern Mediterranean subregion are relatively young. Most became independent shortly after World War II. Cyprus received its independence from Britain in 1960. These nations face many economic problems. Political divisions, refugees, lack of water, and a weak infrastructure make it difficult to develop healthy economies. The creation of Israel produced a large number of Palestinian refugees. Today, those refugees and their descendants total almost 3.6 million people. They are scattered across many of the countries in the region. Some still live in UN-sponsored camps. Many of the refugees have struggled to find adequate food and shelter. Many of them are unemployed. Providing education and other services for them is difficult for nations such as Jordan, one of the poorest in the region—and the one with the largest Palestinian refugee population. Civil wars in Lebanon and Cyprus have also caused huge economic problems. Lebanon, a more developed nation, was hard hit by a civil war that lasted from 1975 to 1976. The conflict widened to include other nations, and in 1982 Israel invaded Lebanon. Some Israeli troops remained in Lebanon until 2000. All of the nations of the Eastern Mediterranean subregion have great potential for development. They have a good climate for producing citrus crops and many places for tourists to visit. They are well located for connections to international markets in Europe, Asia, and Africa. What many of them lack, however, is an infrastructure that would support a growing economy. Roads in wartorn areas, for example, must be rebuilt. Especially needed are irrigation systems to make the area bloom. Better communication systems and power sources are needed for developing high tech industries in the region. Israel has been able to build sophisticated industries such as computer software development. Modern life in the Eastern Mediterranean is a curious blend of old and new. Strong cultural traditions exist but they are combined with changes that were brought about by modern innovations. Cell phones, computers, and Internet access are increasingly common. One aspect of life here that remains quite traditional, however, is the dining experience. Eating in restaurants in Eastern Mediterranean countries is not as common as in the United States. Some restaurants have separate sections for men and women. Cafes serving coffee and tea are generally for men only. Most meals are eaten in the home. Families and sometimes friends gather to have meals. The last meal of the day is usually served between 8 and 11 P.M. Typically, a meal begins with small portions of hummus, ground chickpeas mixed with lemon juice and parsley, and baba ganouzh, an eggplant dip served with pita, a flat bread with a pocket. A salad called tabbouleh, made of bulgur (cracked wheat), parsley, onions, mint, tomatoes, and lemon juice, is common. Chicken or lamb is more likely to be served as a main course than beef. Many meals are finished with fresh fruit or sweets such as kolaicha, a sweet cake made of barley flour, sugar, oil, and cardamom seed. Thick coffee or tea is also served. The host of a dinner may not eat with the guests so that he can attend to all their needs during the meal. Muslim Arabs make up the majority of people who live in the countries of the Eastern Mediterranean. However, in several nations, especially Lebanon and Israel, there is a variety of cultures. Since the seventh century, Lebanon has been a refuge for both Muslims and Christians. Many of the Muslims there are Shi’ites, as compared to the Sunni majorities in many of the other nations in this region. A small group of Druze also live in Lebanon. This tightly knit group is very secretive about its religious practices. The members live in the mountainous areas of Lebanon and also in Israel and Syria. Christians of the Maronite tradition (Roman Catholics following Eastern Orthodox practices) and the Eastern Orthodox tradition make up a large minority in Lebanon. Together, these groups present a wide variety of cultures and religious practices. The variety makes it difficult to build unity in the country. Israel is a land with a tremendous variety of immigrants. The majority of immigrants are Jewish, and they arrive from all over the globe. They come from the United States, Eastern Europe, the Mediterranean region, Russia, and Ethiopia. The focus of Jewish culture helps to draw most of this diverse group together. In addition, Israel is home to Arab Muslims of several different groups. Bedouins live in the Negev Desert. Druze, Sunni, and a group called Circassians come from the Caucasus Mountains area. Also living in Israel is a small number of Christians and people following the Baha’i faith. The combination of all these groups brings a variety of languages and lifestyles to Israel.